A young family of five is benefitting from lower electricity bills thanks to new, cutting-edge technology from Dimplex, which enables them to use surplus energy produced by their own solar PV system. Dimplex Free-E works with a homeowner’s solar PV installation to provide free hot water and research suggests it could help more than 550,000 households in the UK save money. 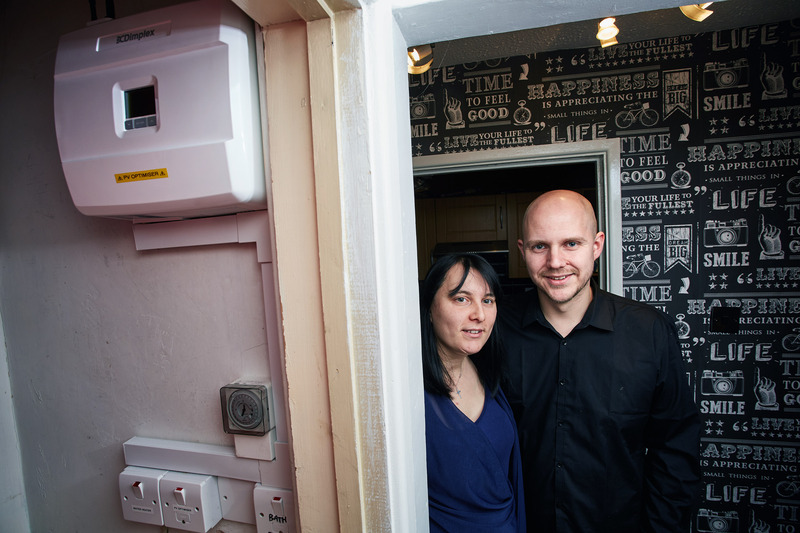 The Paget family, who live in a four-bedroom home in rural Herefordshire, were among the first to install Free-E in summer 2015 and early analysis of the system shows they have already saved almost £200 in the first 12 months. They can expect to claim back the cost of installing the system in less than three years. Like thousands of householders across the UK, Mark Paget, who lives with his wife Kelly and three young children, chose to install a solar PV system to reduce the family’s electricity bills. The 3.64kWp system, comprising 14 panels, uses the sun’s rays to generate electricity and enables the family to benefit from the government’s Feed-In Tariff (FIT) scheme, which pays between 11-13p per kWh generated. The intelligent energy management system, which includes an energy meter located at the incoming mains and the Free-E unit in the airing cupboard, was installed by Dimplex installer partner GSR Heating Ltd. It uses wireless technology to divert surplus energy generated by the solar PV system to the dual immersion heater in the family’s 115 litre domestic hot water cylinder, providing free hot water for Mark, Kerry and their three children. Dimplex has been closely monitoring the system since it was installed and data based on the first 12 months shows that the family has saved £192, taking into account the winter months when solar generation inevitably drops. There are other benefits too. Currently the Government has no way of knowing exactly how much electricity is used so the FIT estimates that 50 per cent of the electricity generated will be exported back to the grid. It means householders who had their system installed before March 2016 can earn additional income (up to 4.85p per kWh depending on date of installation) for half of the electricity generated, whether they use it or not. Mark adds: “The installation of solar PV has allowed us to halve our direct debit with the electricity company from £160 a month to £80. Free-E means I am saving another £16 each month just by using the surplus energy that would otherwise be lost – and still continue to receive payments through the Feed-In Tariff for the supposedly ‘unused’ electricity. It’s a win-win situation." Chris Stammers, marketing director at Dimplex, said: “Around 620,000 homes in the UK already have solar PV panels on their roofs but less than 10 per cent of those are set up to be able to use unused solar energy. “Obviously the majority of PV arrays generate maximum energy during the day, when light levels are at their peak. Therefore homeowners who tend to be out for the majority of the day, at work for example, are not able to reap the benefits of their solar PV panels by using the electricity they generate - and so their surplus energy is exported back to the National Grid. “If surplus energy is available, Free-E will divert this free energy to the immersion heater rather than allowing it to be exported back the grid – meaning the homeowner’s hot water will be heated for free.